Philip Blumel: Change is in the air. Do you feel it too? Hi, I’m Philip Blumel. Welcome to No Uncertain Terms, the official podcast of the Term Limits Movement for the week of January 14, 2019. Stacey: Your sanctuary from partisan politics. Philip Blumel: We’ve been here before. We drop a congressional term limits amendment bill in the US Congress and then we listen for the crickets. But somehow this year they’re being drowned out by noisy reporters and newscasters. Maybe US Term Limits executive director, Nick Tomboulides, has some insights for us on this. 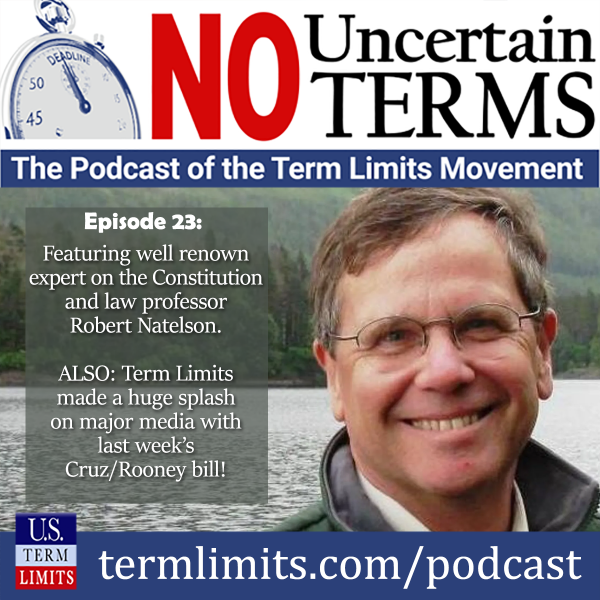 Philip Blumel: All right, so last week in our podcast we announced the big news that the US Term Limits amendment bill has been dropped sponsored by Senator Cruz and by Representative Rooney and it’s gotten quite a reaction. There were several reports on CNN and on Fox News and I started getting calls and emails that people had seen these things and as I started Googling, I saw that there is just an incredible number of outlets that were on top of this. We’ve been doing this a long time but we usually don’t see this kind of reaction from dropping the term limits amendment bill. Why do you think this might be? Nick Tomboulides: I don’t know exactly why this is the case. Philip Blumel: I don’t either. Nick Tomboulides: But it’s an exciting time to be a term limits supporter. We have actually doubled the number of co-sponsors on both of these resolutions since our last episode. We’re now up to 23 co-sponsors in the House version and seven co-sponsors on the Senate version. Philip Blumel: And this is before we go around knocking on people’s doors haranguing them to get on the bill because they signed our pledge. They’re just coming out of the woodwork and jumping on the bills. Philip Blumel: I had the same reaction. Nick Tomboulides: US Term Limits is the reason this bill exists. Philip Blumel: Yes, I know about that. Nick Tomboulides: We’re the reason this bill exists because we have been working behind the scenes tirelessly over the last few years recruiting candidates and incumbents to sign our pledge and build some momentum for this, so it is very, very exciting to see. I don’t know exactly why it’s getting so much more coverage this time around, but that is undoubtedly a very positive development. Philip Blumel: I know why I’m particularly excited about it and I will admit that we’ve, over the years, we’ve introduced these bills in sort of a perfunctory way, setting the table we called it, looking forward to the day when it will be important, when it will really matter. And I know why I’ve been getting excited about it, because we have things leveraged that we didn’t use to have before, like for instance, this congressional pledge program has been very successful where we go to candidates before they’re elected and have them sign a pledge, “If I’m elected, I’m going to co-sponsor the bill”, that’s been very successful. So we’re putting leverage on Congress by doing that. And then of course, the Term Limits Convention push down in the states where now we have three states that have officially called for a term limits convention under Article V of the Constitution to propose an amendment for congressional term limits and as we get more and more states, that’s going to put more and more pressure on Congress. Philip Blumel: I’m paying more attention to our own bill. I’m more excited about it but I didn’t think that, that would have trickled down to CNN or Fox yet but it’s getting there somehow. Nick Tomboulides: And I think there may be a sense among congressmen who look out at the landscape of the states and see that the states are getting active on Article V, the states are threatening to call a term limits convention and they may be saying, “We may have to propose this amendment, otherwise the states are going to do it for us”. And if the states propose the amendment, that is not going to be friendly to the current congressmen. It’s probably going to be retroactive, it might be a short-term limit that throws a whole bunch of people out all at once. It’s exactly what we want, of course, that’s why we’re doing this. But Congress may see that as a possibility and they’re starting to realize they need to act now, they have to take this issue seriously or they’re going to be termed out even faster than we thought. Speaker 8: Move over career politicians, GOP lawmakers are now introducing an amendment to the Constitution that would impose term limits on members of Congress. The bill calls for a maximum of three two-year terms in the House and two six-year terms in the Senate, but will this get any traction on the Hill? Let’s ask one of the bill’s sponsors, Republican Congressman, Frances Rooney of Florida. Good morning, sir. Francis Rooney: Good morning, thanks for having me on. Speaker 8: We appreciate it, we want to let you make the case. We’ve been all morning about how democrats have introduced, for example, these efforts to abolish the electoral college and we’ve been breaking that down and wondering whether that’s an over-reach. State your case and push back on the critics who say this is an over-reach. Francis Rooney: The founders never envisioned a professional political class. They envisioned, like Thomas Jefferson, people come off of their farm or leave their business, do public service, and go home and have some new people come in with fresh ideas. This is a much more … a better way than having these entrenched politicians who are too aligned with special interests over a period of years. I would think 18 years is plenty of time to serve your country in Congress. Speaker 8: Well, Congressman, the President talked, as you know, in the campaign about draining the swamp and apparently there are some voters who believe a key part of that is your move. Look at this poll from McLaughlin and Associates. 82% of likely voters approve of a constitutional amendment limiting terms of members of Congress. Only 9% disapprove. This is from about one year ago, January 2018. If there’s so much public support though, why has this not gotten traction before? Francis Rooney: Maybe that’s why Congress has an 11% approval rating among the people. Maybe the Beltway is not the country, maybe the country is the country. You know, if you take that figure, you could find that replicated or broken down in all kinds of subsets, socio-economic, different interest groups. Nobody wants career politicians, they want term limits and you know, I’m just a business guy. I figure if 80% of my customers want something, my job is to figure out how to get it to them. Speaker 8: So Congressman, I only have a minute left, you know the argument against it and I want to articulate that now. And part is you have congressional staffers who sometimes stick around for 30 years and they learn Archean tax policy or healthcare policy. You have lobbyists who stick around for decades, as well. If you move out the politicians, don’t you give the lobbyists and the staffers even more power? Francis Rooney: But that’s an argument that the people are too dumb to be governed in a democracy. I haven’t found this legislating business to be particularly difficult. It’s a whole lot more difficult to drill a 10,000 foot oil well than it is to be a legislator. Speaker 8: Congressman Francis Rooney making his case this morning. Appreciate you coming in. Philip Blumel: Another interesting note going on in the US Congress. You know, we’re paying attention to our new US term limit amendment bills being dropped and so we’re looking also at other term limits bills that might have been introduced and one of note is from a congressman from South Carolina, Ralph Norman, who wants to put a non-binding national referendum on the state ballots in 2020 in every state and ask the voters this; should Congress approve a Constitutional amendment to limit the terms a member of the House of Representatives and US Senate can serve in office? And his reason for doing so is so that Congress can be made aware of where Americans stand on this issue. Well, they already know that, but just in case. I think it’s a great idea to try to put this in the face of Congress and say look, this is what the people want, we want you to do it and as many times and as many ways we can get this in front of Congress, we should do so. Philip Blumel: It’s an interesting an idea and when I first heard it, the first thing I thought of was it actually might not even be legal because there really is not, as Stacy explained in, I think the last podcast, or maybe the one before, there’s really no such thing as a national referendum on anything. What we have is a bunch of state ballots and so I was afraid, well does Congress really have the power to put something on all the state ballots except for a federal issue? Well, I looked into it and you know, first of all they do and when I looked in the Constitution, you look under Article I, Section 4 where it has some of the rules regarding Congress and elections, Congress actually has tremendous power over the state ballots to make sure that they don’t muck up the federal elections and what not and for other reasons. And so they do have that power. Philip Blumel: And interestingly, Congress has tried to exercise it a couple of times in the past including on term limits. Back in the 90s, Representative Peter Hoekstra from Michigan introduced a bill called, Voter Opportunity to Inform Congress Effectively Voice, which is the same name that Representative Norman is using, and it would have put the question on the ballot. Should Congress approve a Constitutional amendment to limit the terms that a member of the US House of Representatives, and the US State Senators can serve in office? Basically the same question, and it didn’t pass, didn’t get put on the ballot, but the idea had already been floated in the past and there were other cases. In 1924, the democratic party asked for a national referendum on consideration of US membership in the League of Nations. In the 60s, 1964, Representative Charles Gubser sponsored a resolution to create a yearly nationwide advisory opinion poll on various issues and that idea was brought up again by House Majority leader, Richard Gephardt in the 80s. So this is a recurring idea of having a national non-binding, by the way, referendum on national subjects and the second time that term limits, in particular, come up. Nick Tomboulides: I can’t imagine what the argument would be against this. And what valid reasons they would have not to do it. It’s not as if this actually costs taxpayers an additional cent. There’s going to be an election in November 2020, whether this question is there or not, doesn’t cost anything to print this question on the ballot and take the public’s temperature on term limits in a significant, meaningful way. I think Congress doesn’t want it on the ballot because they know it’s going to pass. They know it’s going to pass with a strong bipartisan super majority and if it does pass, it would paint Congress in a corner. They would be forced to act on term limits, which is their worst nightmare. So it’s a very innovative concept, I think it would serve its intended purpose if it were to get some traction, but unfortunately this is not something I see reaching the light of day in Congress in the near future. I think the leadership is going to try to bury this bill. It’s possible that as we get more momentum on the Article V front, that Congress may choose this is the path of least resistance, but right now it doesn’t seem like it has much of a chance. Philip Blumel: We’ll follow it nonetheless, but I think you’re right. Rick Tyler: 1-800-966-1039. Caller, hi. He’s George Hale, I’m Rick Tyler. We’d like to know what tee’s you off. Philip Blumel: Lawyer and law professor, Robert G. Nadelson, is the nation’s most published active scholar on the US Constitution’s amendment procedure. He is currently senior fellow and constitutional juris prudence at the Independence Institute in Denver. We talked to him last week about his latest book, The Law of Article V, State Initiation of Constitutional Amendments. Philip Blumel: Okay, great. How are you doing? I want to talk to you about your new book. I know that you published so many books and handbooks and reports and articles on the law surrounding Article V, in fact your scholarship is probably the greatest inspiration for US Term Limits for us to pursue a strategy of amending the Constitution using the state amendment process. What does this new book add to your writings on the subject? Robert Nadelson: First I want to thank you for the compliment. I was unaware about that, of that regarding US Term Limits motivation, but it’s very gratifying. What this book does is it pulls everything together that I’ve written and adds a few things. For example, it includes all of the approximately 50 court cases that have been decided on Article V issues ranging from 1798 all the way up to last year. I don’t think that there’s ever been a collection quite like that. In addition, it discusses some of the historical material and also provides the reader with guides to further reading. So sometimes, for example, people ask the question, “How do we know that an Article V convention is a convention of the states of the kind we’ve had historically?” This book doesn’t cover all the evidence because that would make it very long, but it cites the Supreme Court opinion that says that a convention for proposing amendments is a convention of states and then it includes footnotes that tell you where to find the founding era documents that say the same thing. Philip Blumel: Right. Those are extensive footnotes. Robert Nadelson: Yeah, that’s right. So in addition to that, it includes various forms for applications, for instructions to state commissioners and so forth, that can be used by any Article V movement. Philip Blumel: Right. And the forms are interesting because they’re for an application, for basically everything you need. This is, in some ways, is a how-to book for, I want to say lawyers, because of the way that it’s organized. Is that fair? Robert Nadelson: Yeah, it’s mostly directed toward lawyers and people who make laws, that is to say, state legislators. However, based on the sales numbers I’ve seen, I know that a lot of Article V activists are buying it and presumably one of the reasons they’re doing that is to provide it to state legislators and others who are involved in the process and who are curious about the legality. Robert Nadelson: One of the claims is that there is no law out there, there are no precedence out there, that the courts don’t take Article V cases, and all you have to do is leaf through this book and see how wrong that is. As I mentioned, there are about 50 different Article V cases and there is an enormous quantity of precedence that the book references. So part of its value is just letting people know yes, there are guidelines out there. Philip Blumel: I was amused in the book of your description of this science fiction vein of writing about Article V. I guess this is sort of a vein of writing that emerged in the 60s and 70s and usually from the far-right or the far-left and there is still schools of that kind of thinking around out there. Let’s say opponents of term limits will try to stoke the fears of well-meaning citizens who have no information about Article V or conventions, whatever, and without information, will spin wild speculations about what might happen. With all the new scholarship that you and others are doing, is this science fiction mindset fading? Philip Blumel: I think so too. Robert Nadelson: Let me explain to your listeners a bit of what we mean by science fiction. I like to talk about this because I’m a science fiction buff and have been ever since I was a teenager. If you read science fiction books in the 1950s, 1960s or so, discussing the planet Venus, you know some astronauts, whatever, land on the planet Venus, a very common scenario in peoples mind was well, Venus is a jungle. It’s a big swamp and there are dinosaurs, because it’s a hot place, it’s closer to the Sun and it’s foggy and so forth. Of course, we had no idea what the surface of Venus was like. We didn’t have knowledge. It’s all covered with clouds. Well, we subsequently discovered when we actually investigated and sent down probes into the surface of Venus that there’s no water on the surface, it’s about 800 degrees fahrenheit. The atmosphere consists of carbon dioxide and sulfuric acid. There were no dinosaurs or pteranodons there. Robert Nadelson: So all we needed to do is we needed some information in order to correct these wildly speculative views. Well, the same thing has happened with an Article V convention. In the 60s and 70s, there were a number of academic writers, as well as journalists, and political speech writers who, as you just said, spun all of this speculation based upon no knowledge. Now, much of that information was already available. If they had done their homework, they would have found the Supreme Court opinions, they would have found founding era records. While we have some additional information since the 60s and 70s, most of it was already in place. They didn’t want to do their homework, they just wanted to spout off and talk about how horrible it would be to have an Article V convention. Philip Blumel: How far away do you think we are from seeing our first Article V convention? Robert Nadelson: Well, part of it depends upon how fast you guys at US Term Limits get these applications you need. Philip Blumel: We’re going to get a couple this year. Robert Nadelson: I have been seeing some polling data regarding the popularity of term limits in America and it is just astronomical. In fact, it’s a classic case where you’ve got overwhelming popular support for something but Congress is so entrenched and so eager to defend its own prerogatives, it will not propose an amendment. This is precisely the kind of situation for which they wrote the convention process into the Constitution. Philip Blumel: What would you recommend is the best primer for an intelligent layman who wants to tackle the subject? Is this the book? Robert Nadelson: Well with the word intelligent, yes, I mean if you read well, even though it’s about the law of Article V, it is … there’s no technical language in it. Law professors love to use phrases like, incorporable hereditaments, you will not find phrases like that in this book. Also, if you prefer to get your information from the web, I manage a website called the Article V Information Center, it does not promote any particular Article V movement, but it does encourage people to use this constitutional right and there’s an enormous amount of material on the Article V Information website including information about the law but also information about prior conventions, why they were called and when they were held and so forth. And so there’s plenty of browsing material there. Philip Blumel: Okay, so that might be the first stop. And what’s that website again? Stacey Selleck: Listen to the complete unedited interview at termlimits.com/podcast. Philip Blumel: The excitement that we have about our US term limits amendment bill is largely because of the pressure we’re starting to put on Congress from the states. So, let me ask you, Nick. You’re dealing with the team out there in the field every day, is anything moving so far in the states? I know that the sessions are just getting under way, but we should have some bills drop soon. Nick Tomboulides: We should soon. We don’t have any bills, official bills, yet but in several of our states we have been pre-filed, which means that the language for the term limits convention has been submitted to the drafting committee and when that comes out we will have numbers. Arizona, for example, we should have numbers possibly within hours, we’re awaiting that because we have several states, which went about half the distance last year. Utah, Georgia, Arizona, we passed a single chamber in those states. Our teams on the ground, field staffers, regional directors, volunteers, activists, have been working so hard to make sure that we can finish the job in those states in 2019. We do have updates, I just got an update from Arizona. Our Arizona state director, Suzette Myers told me that Speaker-Elect Rusty Bowers whose taking over this session, has agreed that this would be a worthwhile resolution for his chamber to consider. That is a great development because up until this point, we weren’t sure whether he was on our side. He was kind of sitting on the fence. Nick Tomboulides: We have a great sponsor in Arizona, Representative Townsend. She’s been on this broadcast, we’ve interviewed her, she’s a former whip in the state house, so we should have no problem there. We’re debuting the bill with bipartisan support, republican and democratic sponsors. It is looking very, very good right now in Arizona thanks to the work of our grassroots army. Philip Blumel: Last week we asked you to go to www.termlimits.com/legislators and send a message to your federal representatives urging them to co-sponsor the Cruz/Rooney US term limits amendment bill in Congress. Turns out that possibly not all of the representatives were listed there. As the service who provides the legislator data for our online communication tool was not done posting all the new office holders. After recording last week’s podcast, for instance, I went to the site myself to send a message and only found one senator there. Please don’t be deterred. If you could reach all your reps last week, please return to the site and try again. This morning I went back to the site, and I see it’s all up-to-date. That’s www.termlimits.com/legislators. Also, be sure to subscribe to the No Uncertain Terms podcast. You can use the podcast app on your iPhone or use Stitcher or Google Play on your Android device. Or go to iTunes to subscribe and while you’re there be sure to rate and review us. Stay tuned, the legislatures are now in session. Big news from the states is on the way in the coming weeks. Stacey Selleck: Hi, this is Stacey and I can use your help. I’m looking for a handful of volunteers for our digital department, specifically we are looking for a national letter to the editor coordinator, a software website assistant and social media warriors. The national letter to the editor coordinator will help implement letters to the editor campaigns in our battleground states. He or she will work with volunteers to get short opinion pieces published at key milestones in local newspapers during this legislative session. The software website assistant will help enter advocacy letters and emails into our software program, assist with setting up new webpages in WordPress and help our press team with press releases and lastly, our social media warriors should be able to create Facebook graphics or at least push out content to Facebook, Twitter, Linked In, and Instagram. Of course, specific training is available, but if you already have some of these skills so you can ramp up quickly, that would be ideal. We do have other needs for video editors and graphic artists, as well as data entry people. If you’re wondering how you can help, and have some of these digital skills, why not put them to use and volunteer for US Term Limits. Please contact me at Stacey, with an E, that’s Stacey@TermLimits.com if you interested. Thank you so much for your support.